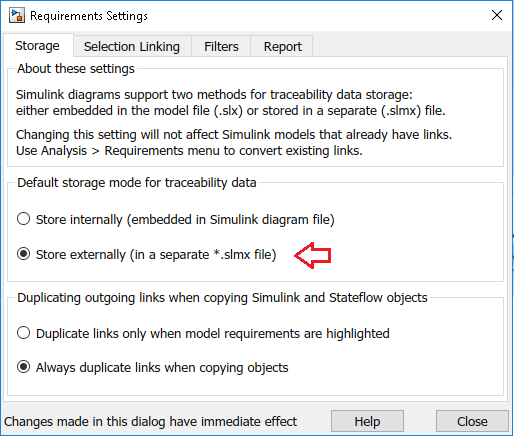 Simulink Requirements supports two different ways to store link data for Simulink models: you can either embed link data in the .slx file, or you can store links in an external .slmx file (external .req file for R2017a and earlier releases). 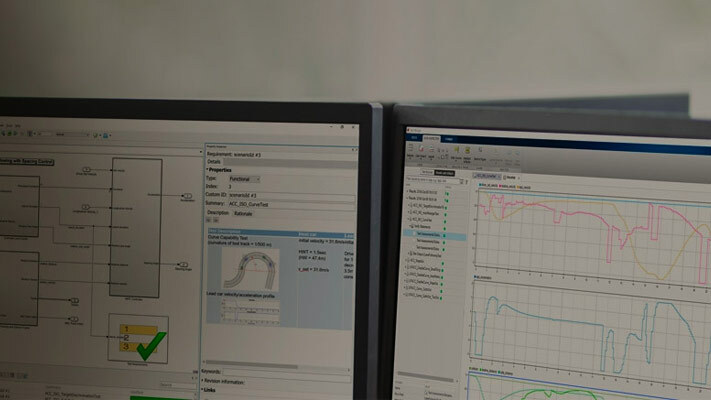 For older Simulink models in .mdl format, embedded storage is not possible beginning R2017b, you must either store link data externally (in a separate .slmx file, or you need to upgrade the Simulink model file to .slx format. You will be prompted to upgrade your data when you load such a model for the first time after upgrading to R2017b. Embedded storage makes it easier to share your work - you do not need to keep track of the extra *.slmx file, but this has the disadvantage that model file is modified every time you add, edit, or delete a requirements link. Additionally, when using external *.slmx files, you can manage multiple sets of requirements links for same model, by configuring your session to load one or the other .slmx file. Select Analysis > Requirements Traceability > Settings and open the Settings dialog box to Storage tab. Click Store externally option button. The default file name for saving requirements links data is ModelName .slmx. 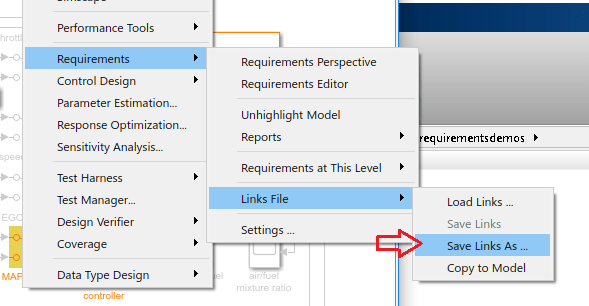 If the file is not present in the model folder, the model is assumed to have no links to requirements, as you can verify by highlighting the model. Click Requirements Traceability > Link to Selection in Word. 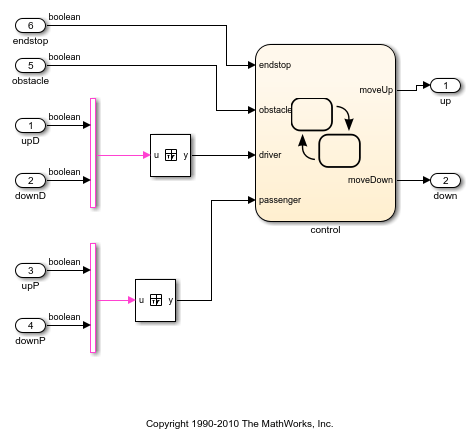 If the model is still highlighted, the Mux block highlights to indicate associated requirements data. Note that the title bar does not indicate unsaved changes. New link information is stored separately from the model. 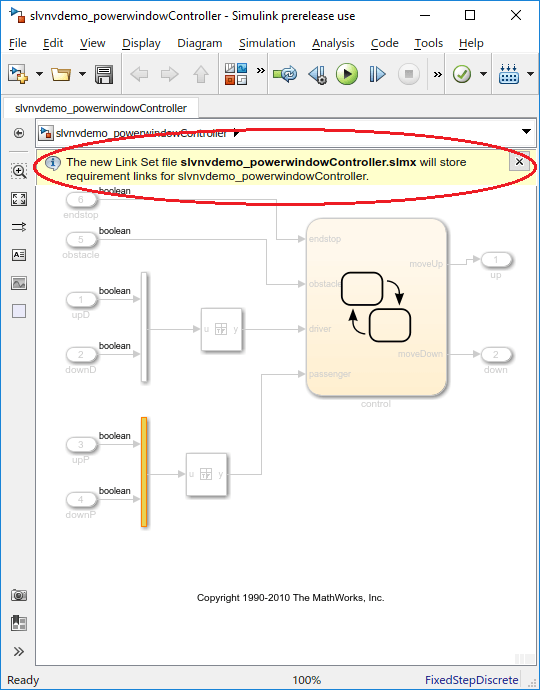 Simulink warns you that links will be saved in a separate file. 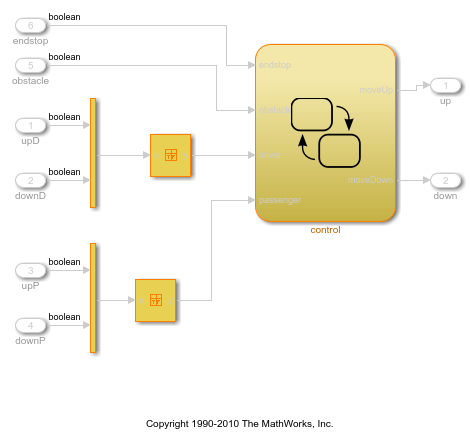 Save or Save As the Simulink model, even if the title bar does not indicate unsaved changes. Close the model. You will be prompted to save links changes if any. Use Save Links... or Save Links As... shortcuts under Analysis > Requirements > Link File submenu. Close the model. You will be prompted about the link that you just created. You may save the links file with the default ModelName .slmx name in the model directory, or choose a different file name and/or location. When you open a model, RMI will try to load requirements links data from the recently used location for this model. You may also select Analysis > Requirements > Links File > Load links... to choose a different .slmx (or an older .req) file. This allows to use several sets of links with the same model, for example, links to design change descriptions that are different from links to original design specifications. 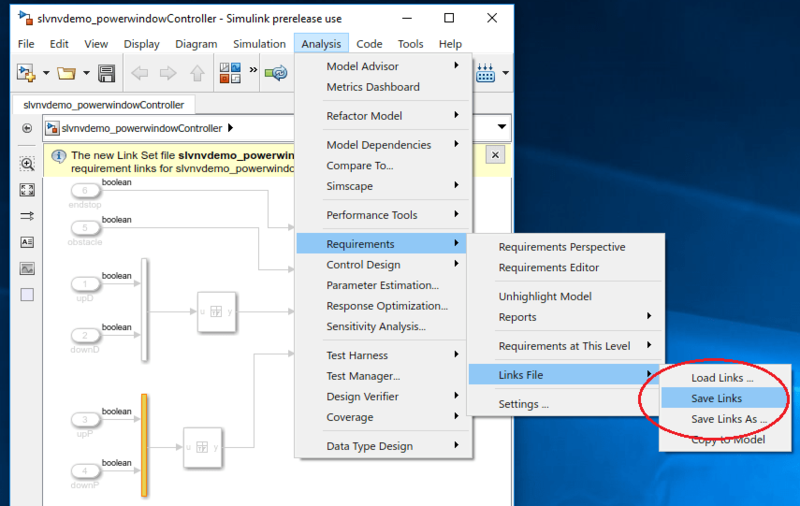 Reopen the model, select Analysis > Requirements > Links File > Load links... to open a file browser and point to slvnvdemo_powerwindowRequirements.req in the toolbox/slrequirements/slrequirementsdemos/powerwin_reqs folder. 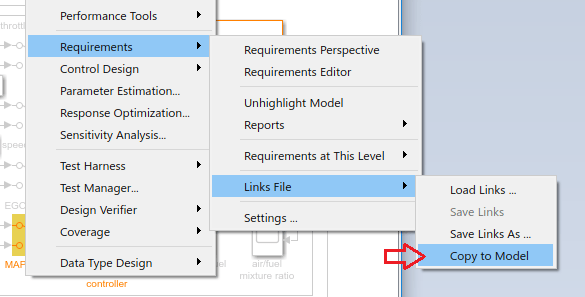 Highlight requirements in the model to confirm that an alternative set of links is now associated with the model. You can navigate and modify these links in the same way you would work with embedded (in-model) links. Open another model that has internally stored RMI data. Resave with a new name to create a writeable copy. Select Analysis > Requirements > Links File > Save Links As... to open a file browser. Your ability to use and manage links in this model now depend on the external file. Highlight requirements to confirm that the link data is available. Now close the model again and delete the external .slmx file. Reopen the model and highlight links. Nothing is highlighted because the data is no longer available. Delete the temporary copy of the model. You will need to carry an extra .slmx file along with the model file. Non-default file name and location associations are stored in user preferences. If you move or rename the .slmx file outside MATLAB, you will have to manually point RMI to the new location when the model is reopened. When one user has configured a non-default location or name for the .slmx file associated with the model, other RMI users will need to manually select Load links when they open the model. The specified location will persist in each user's preferences and does not need to change unless files are moved or renamed again. 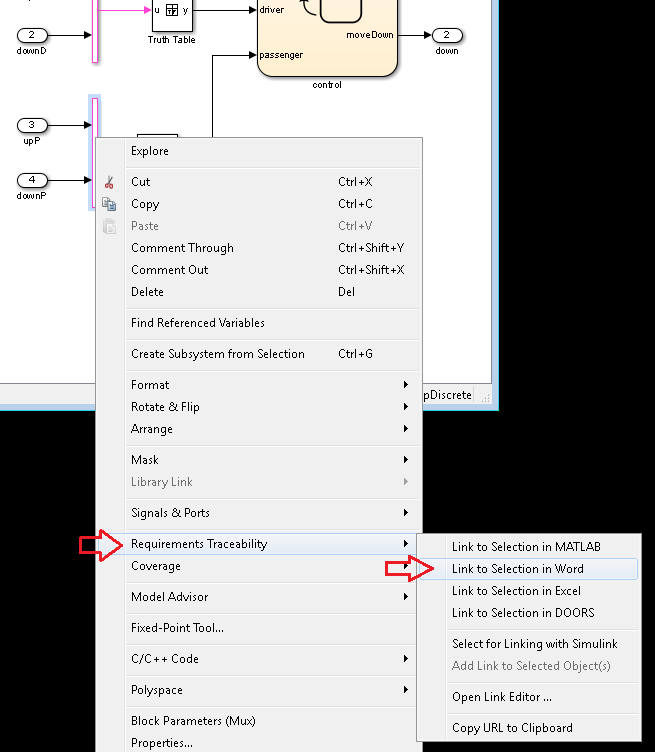 To embed RMI data with the Simulink model, so that all information is in one place and you do not need to track extra files, select Analysis > Requirements > Links File > Copy to Model. The external .slmx file still exists, but it is NOT read when you reopen the model that now has embedded RMI data. 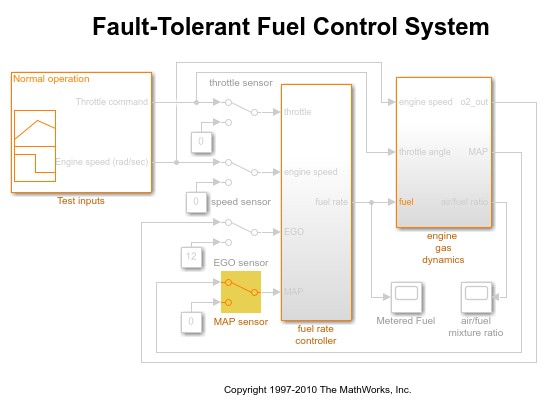 You can try this out with the fuelsys_officereq_copy model. Every change to RMI links will modify the model file. External .slmx files are disregarded when .slx file contains traceability links data. Steps in this example might have created files inside the examples folder and modified your stored mapping of .slmx/.req file names. Click to cleanup.